POLICE PHOTOGRAPH No. 1. CRIME SCENE ONE. YUSUPOVSKII PALACE. The door to the basement is on the right and the door with overhead lintel leads to the ground level of the Palace, 17 December 1916. POLICE PHOTOGRAPH 1a: An enlarged image of police photo No. 1, showing the repair work around the frame of the window on the right. 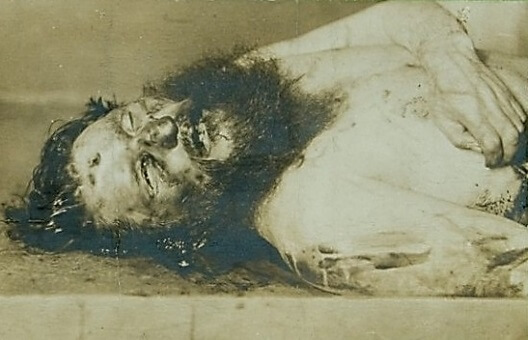 [Published in my Rasputin book in 2010] POLICE PHOTOGRAPHS No. 2 and No.3. CRIME SCENE ONE. YUSUPOVSKII PALACE. Blood spatter radiates out from the stone step. Purple dots appear on both photos, which start near one corner of the step and extend just beyond the second pillar, 17 December 1916. 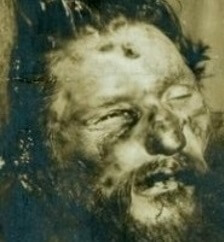 [Published in my Rasputin book in 2010] POLICE PHOTOGRAPH No. 4. CRIME SCENE ONE. YUSUPOVSKII PALACE. The step at the basement entrance. Pools of blood have penetrated into the snow. Shoe imprints are visible, two of which face the door. POLICE PHOTOGRAPHS No. 2 and No.3. CRIME SCENE ONE. YUSUPOVSKII PALACE. Blood spatter radiates out from the stone step. 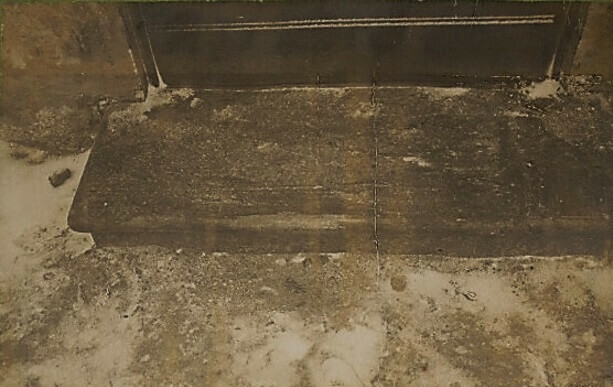 Purple dots appear on both photos, which start near one corner of the step and extend just beyond the second pillar, 17 December 1916. POLICE PHOTOGRAPHS No. 5 and 6. CRIME SCENE TWO. 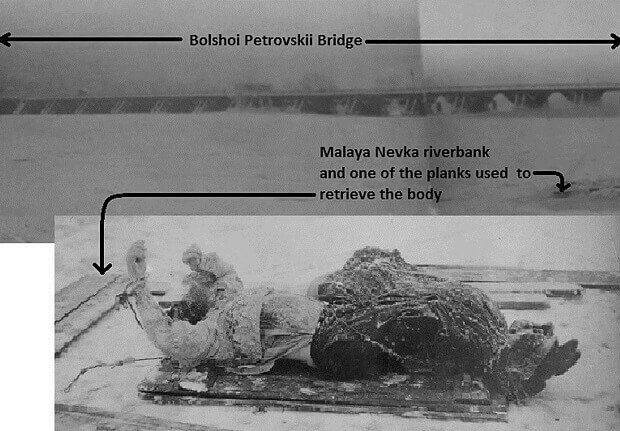 The relationship between the Bolshoi Petrovskii Bridge and the location where the body was retrieved, which is lying on a wooden plank by the Malaya Nevka riverbank. 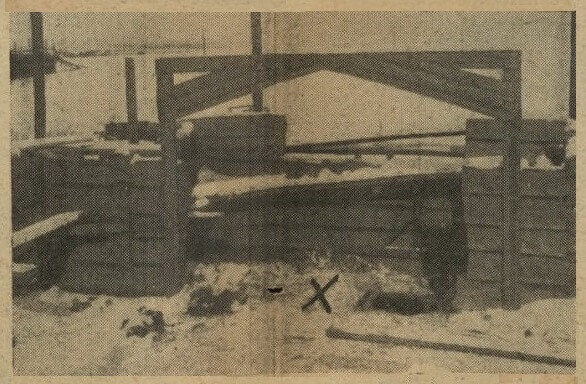 Rope binds the beaver coat to the corpse and the hands were tied with twine that snapped after retrieval, 19 December 1916. POLICE PHOTOGRAPHS No. 7, 8 and 9: Gendarmes, police and government officials standing by the 4thbridge span. Frozen tire tracks veer from the center of the bridge towards the 4th bridge span on the left side (when looking towards Krestovskii Island). 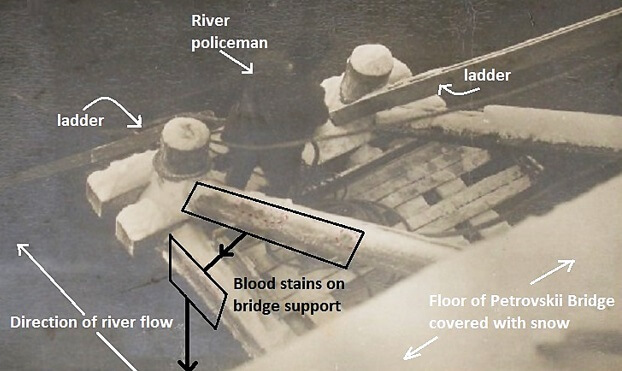 Blood spatter (boxed) appears at two sites on the bridge where the body leant against the railing before it was held by the legs then pushed over the railing, 19 December 1916. POLICE PHOTOGRAPH No. 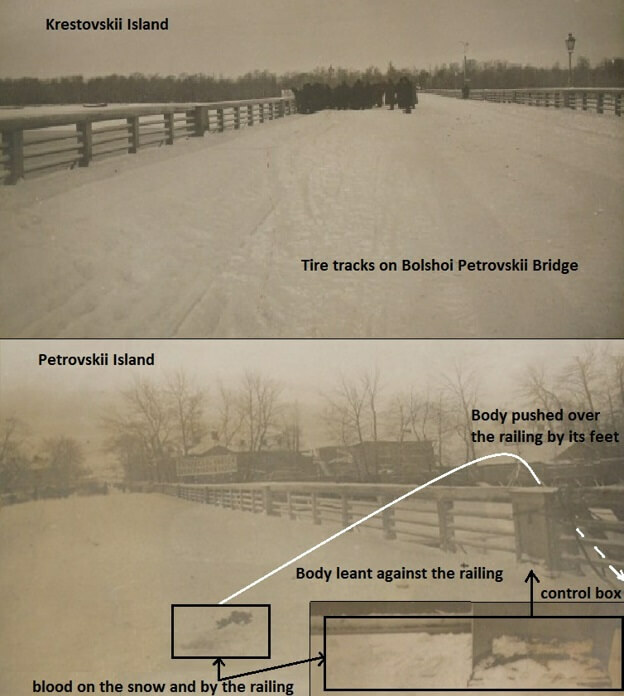 10: The bridge pylon is covered with blood and dislodged snow, indicated by the two boxed inserts. A river policeman is standing on the horizontal support next to one ladder, 19 December 1917. POLICE PHOTOGRAPH No. 13: BULLET TWO was fired near the lower part of the back at close range. The ENTRY wound lies over the vertebral column. A slash injury is evident to the right of the spine. POLICE PHOTOGRAPH No. 11. 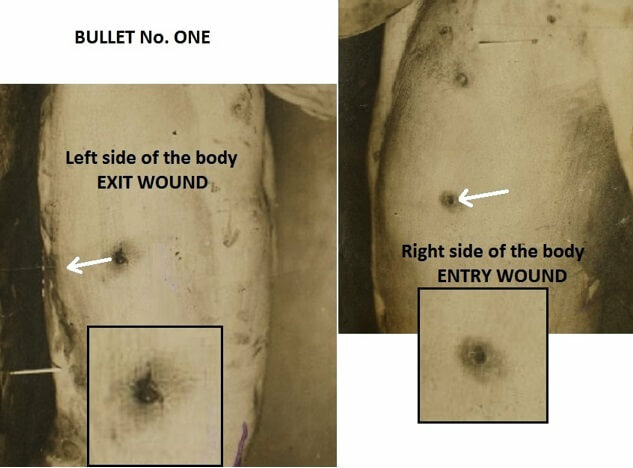 (Left) The ENTRY wound on the left side of the body. POLICE PHOTOGRAPH No. 12. (Right) The EXIT wound on the with radial splits in the skin on the right. 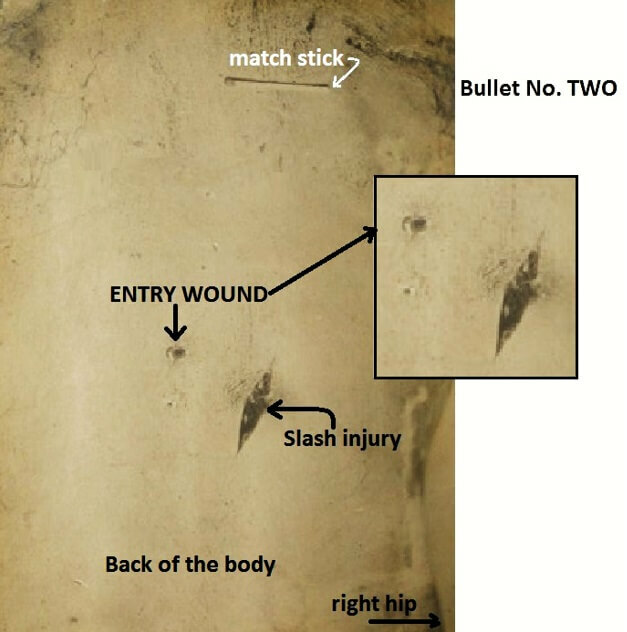 The white arrows show the probable slightly downward trajectory of the discharged bullet. POLICE PHOTOGRAPH No. 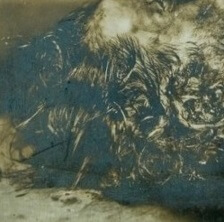 14: The right side of the head shows multiple injuries. The undershirt is torn along the right arm. POLICE PHOTOGRAPH No. 15: The head has been rotated to its normal position. 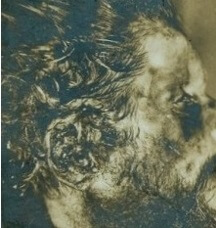 Multiple injuries are visible on the right side of the face and ear. POLICE PHOTOGRAPH No. 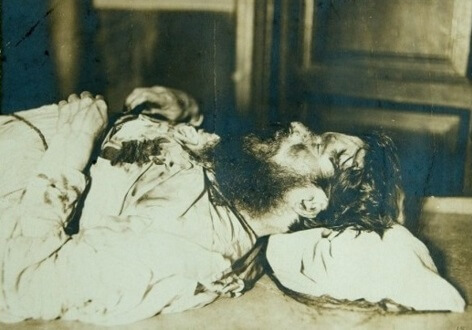 16: This is the last known photograph of Grigorii Rasputin. There is a package and a small spray of flowers on his chest. Police Delo File No. 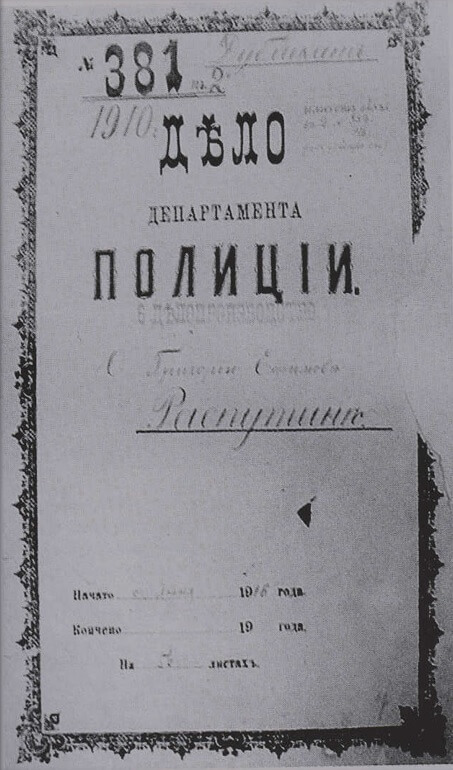 381 (6th Department) with Grigorii Efimovich Rasputin’s name written on the front cover. 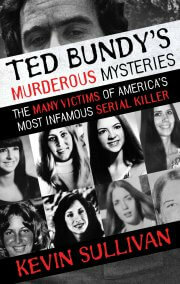 The case was activated in December 1916 and terminated in (March) 1917. 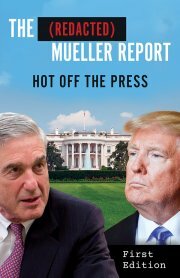 The folder contains 56 pages. DOCUMENT No. 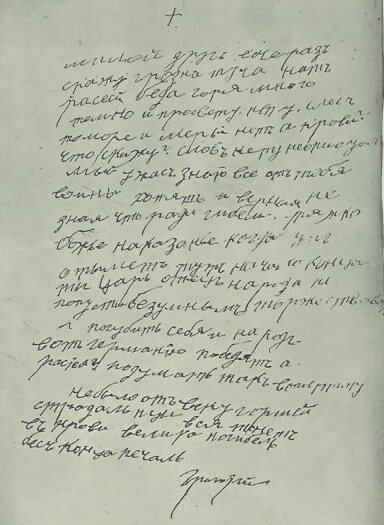 1: Published for the first time, this page from the 1869 Pokrovskoye Church Register, confirms Grigorii Rasputin’s birthdate. 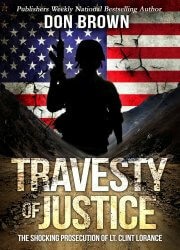 The author has inserted translations. SLOBODA POKROVSKOYE. 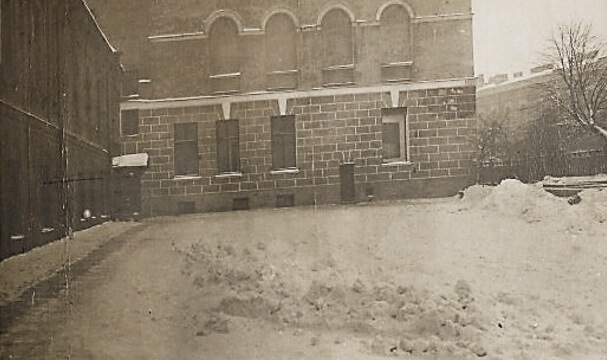 The Rasputin’s family home (on the corner of the street), 1912. SLOBODA POKROVSKOYE. 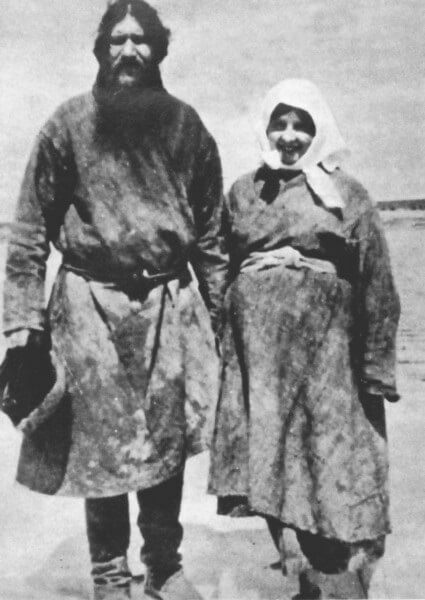 This photograph, taken by Anna Taneeva shows Grigorii and his wife Paraskeva Rasputina, 1914. TSARSKOE SELO. 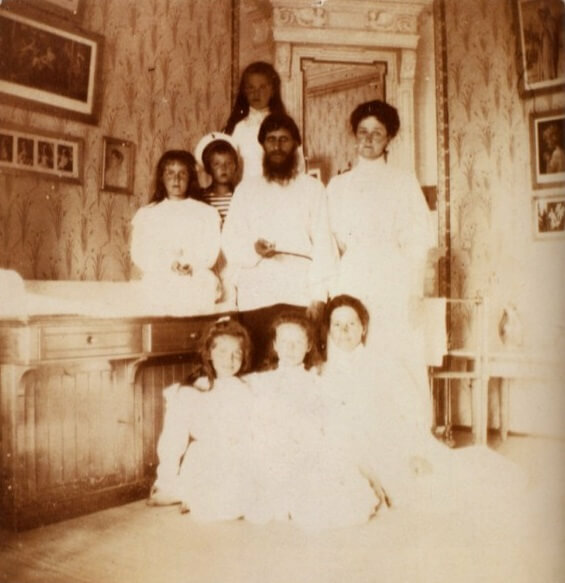 Grigorii Rasputin with Alexandra Fyodorovna, Alexei, his sisters, Olga, Tatiana, Maria, Anastasia and the children’s carer, Maria Vishnyakova, 1908. ST. PETERSBURG. 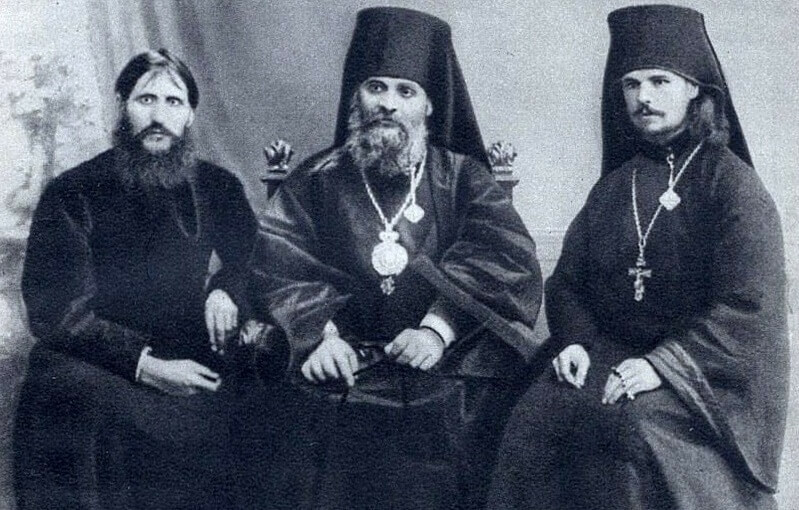 Grigorii Rasputin, Bishop Hermogen and the monk Iliodor, 1911. 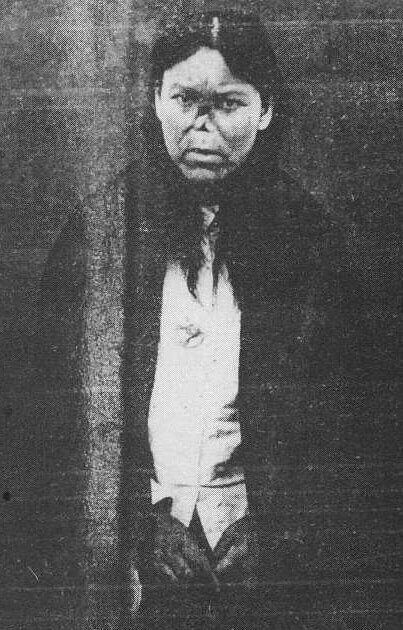 Police photograph of Khioniya Guseva soon after her arrest, 29 July 1914. 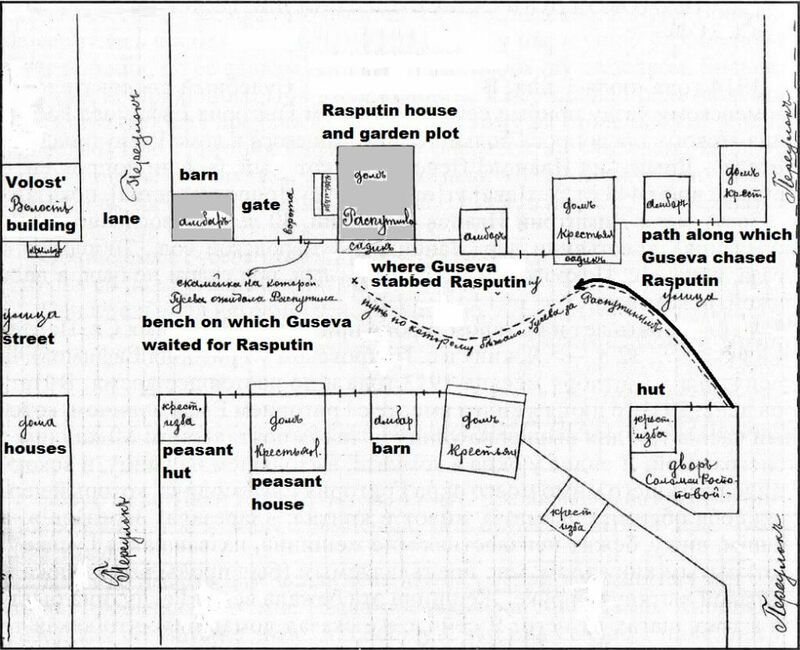 Police sketch of the crime scene (modified by author) in Pokrovskoye, showing the path taken by Guseva before stabbing Rasputin in the street in front of his home, 29 July 1914. TYUMEN. 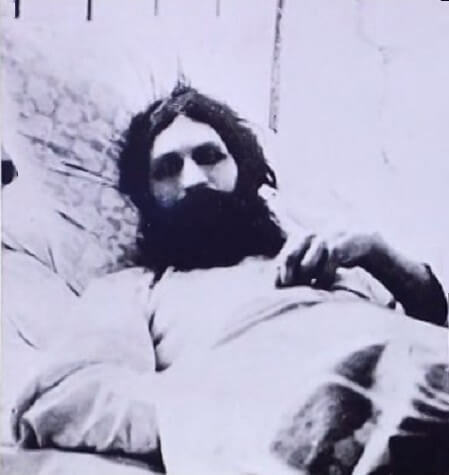 Rasputin recovering in the hospital after an attempt on his life, 1914. St. PETERSBURG. The Emperor lowers his head after announcing Russia’s entry into the War from the balcony of the Winter Palace while several people kneel with lowered flags, 20 July 1914. PETROGRAD. 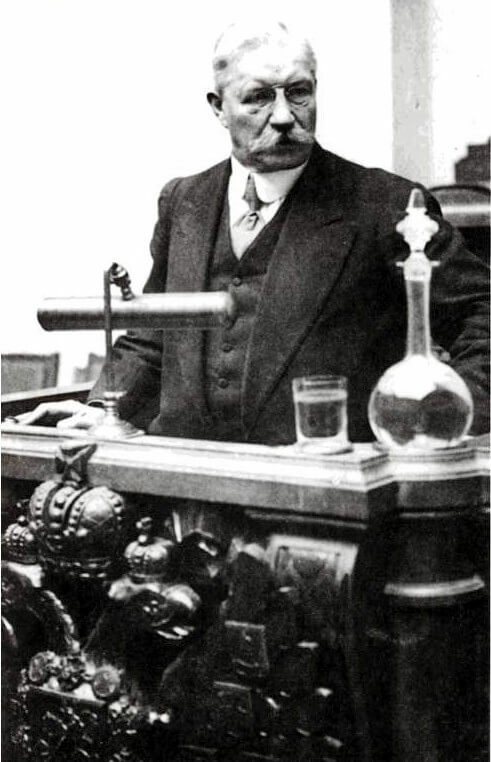 Pavel Milyukov addressing the State Duma, 1 November 1916. 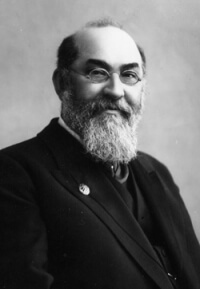 General-Major Pyotr Popov, c. 1916. PETROGRAD. The building belonging to the Ministry of Internal Affairs on Bolshaya Morskaya Ulitsa, 61 with its awning entry faces the Yusupovskii Palace courtyard on the opposite side of the Moika canal. 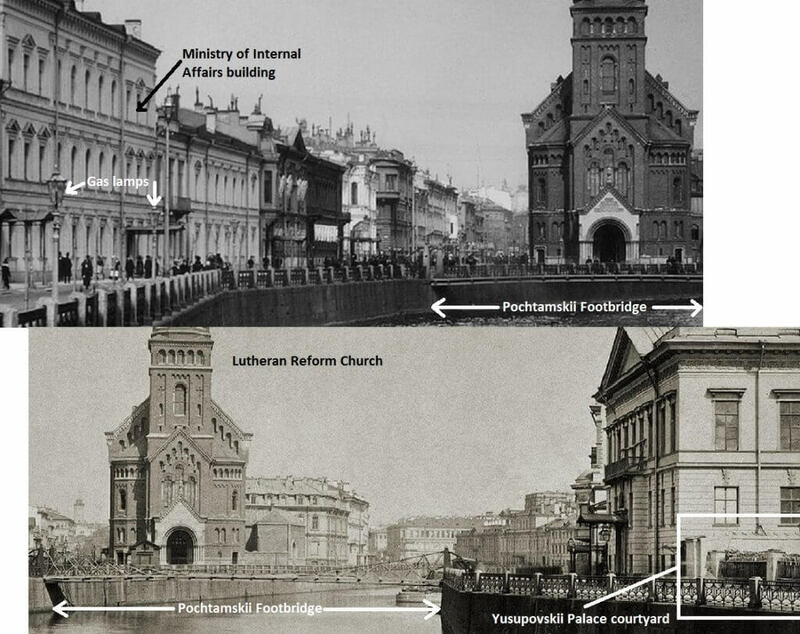 The Pochtamskii footbridge connects both thoroughfares, pre 1916. PETROGRAD. 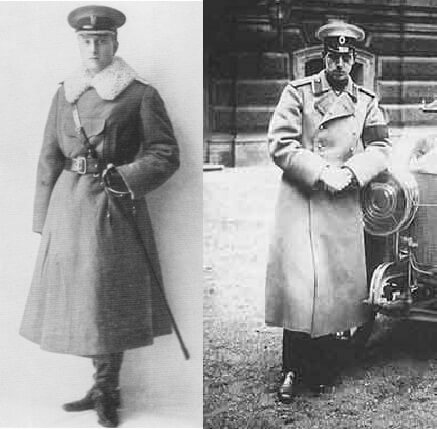 Samuel Hoare (left) and Grand Duke Dmitri Pavlovich wearing winter coats. PETROGRAD. 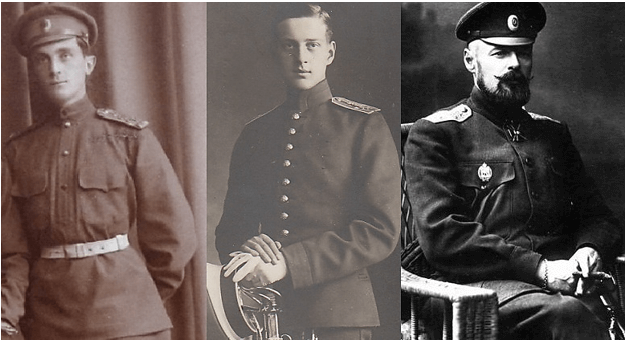 Felix Yusupov (left), Dmitri Pavlovich and Vladimir Purishkevich. PETROGRAD. GOROKHOVAYA ULITSA.View of the apartment building and the Rasputin apartment windows on the third floor that face the main courtyard. The 3 central windows looked out from the reception room, while the two windows to the right, opened from Grigorii Rasputin’s bedroom. PETROGRAD. 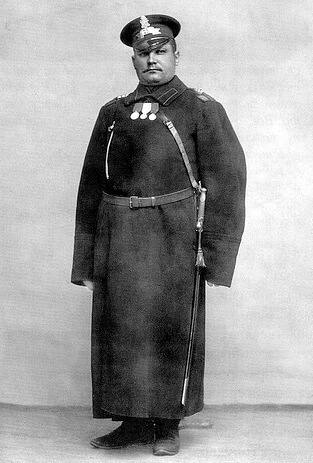 A Gorodovoi wearing his winter uniform with military medals (pre-1916). YUSUPOVSKII PALACE. 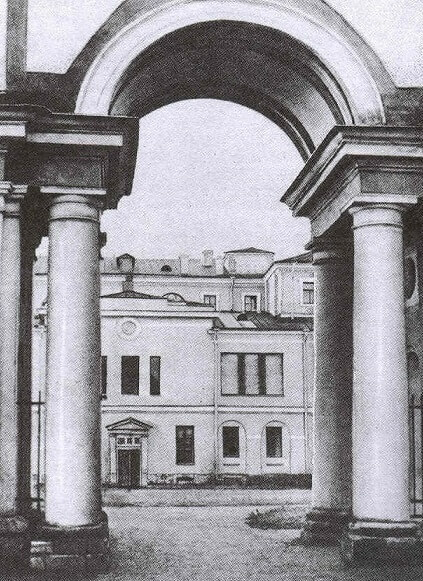 The large inner courtyard and access off Ofitserskaya Ulitsa shows the porched entrance into the building, 1920’s. 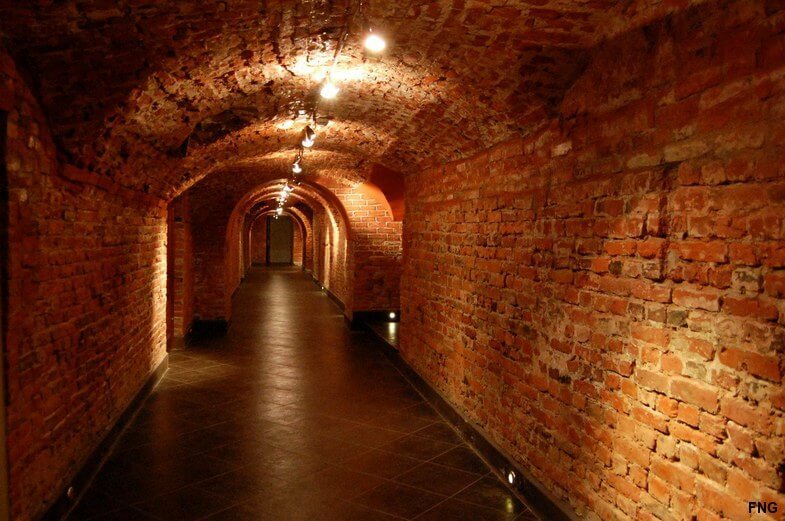 YUSUPOVSKII PALACE BASEMENT. 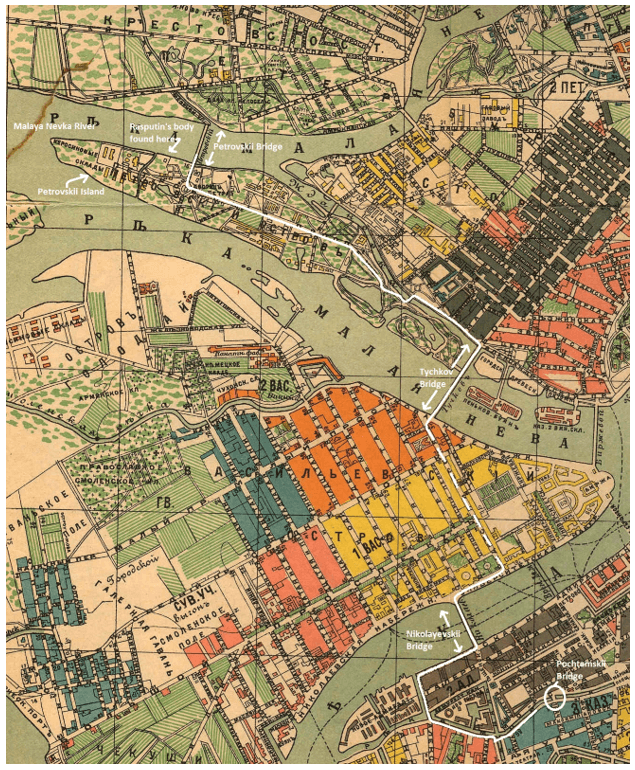 The Garsonerka, after 1917. YUSUPOVSKII PALACE. 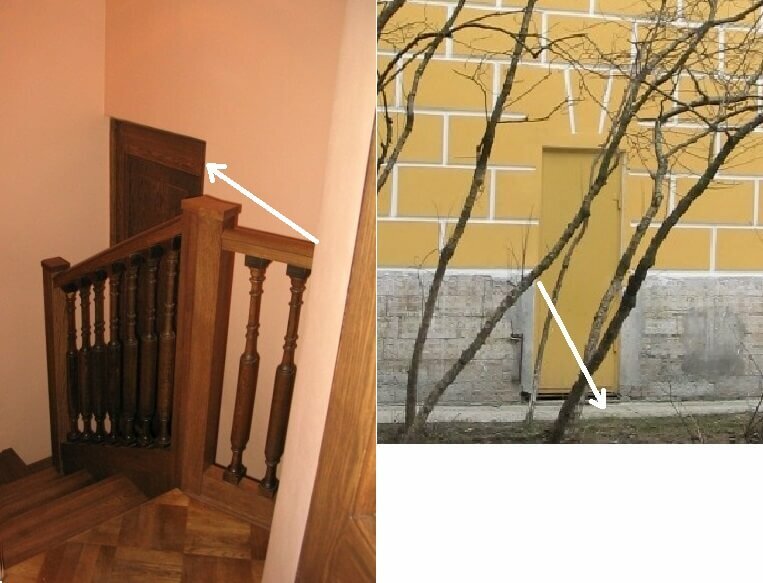 The arrows indicate Rasputin’s flight path from the basement, up a couple of steps, then out into the courtyard. The route taken from the Yusupovskii Palace, in the police district “3 KAZ” (Kazanskii Number 3) to the Bolshoi Petrovskii Bridge that spans across two islands. The Polytechnic Institute complex at Lesnoi can be seen in Grids A 6-9. 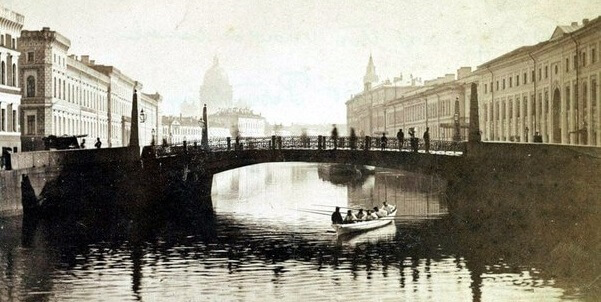 A direct road led to the facility fromPetrograd after crossing the Bolshaya Neva River. YUSUPOVSKII PALACE. The underground network of tunnels below the Palace. The rubber truncheon Maklakov gave to Felix Yusupov. It is covered with a layer of plaited thread. PETROGRAD. Potseluyev Bridge spanning across the Moika canal. The Ministry of Internal Affairs building is just visible on the left and the Yusupovskii Palace is the right side (Postcard c. 1916). 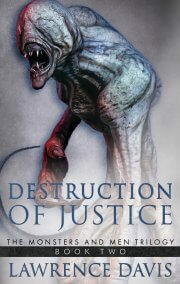 Criminal police agent Mikhailov drew the location of the brown galosh that was found on the bridge support. 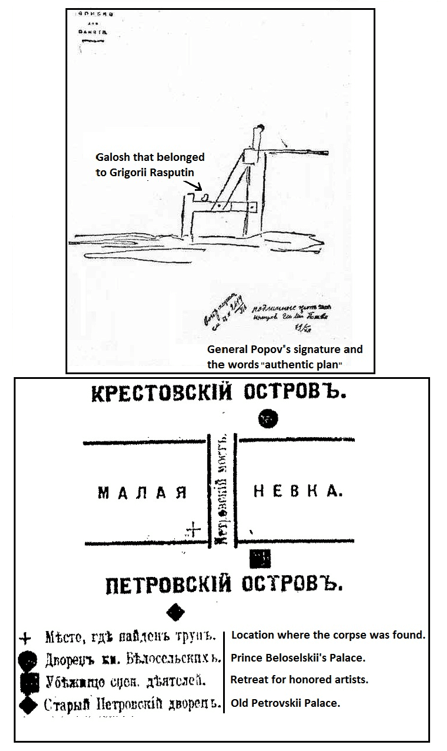 It was identified as authentic by General Popov on 19 December. PETROGRAD. 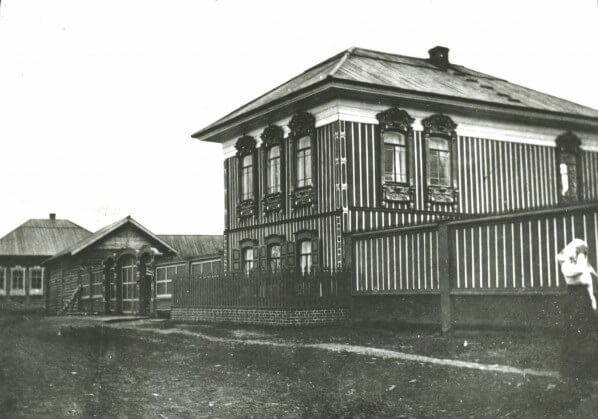 The Chesmenskii military Almshouse, 1914. 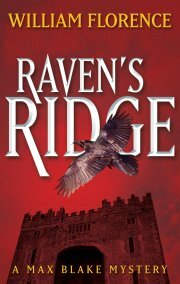 The fingers of the right hand were clenched rather than held together as if in blessing. 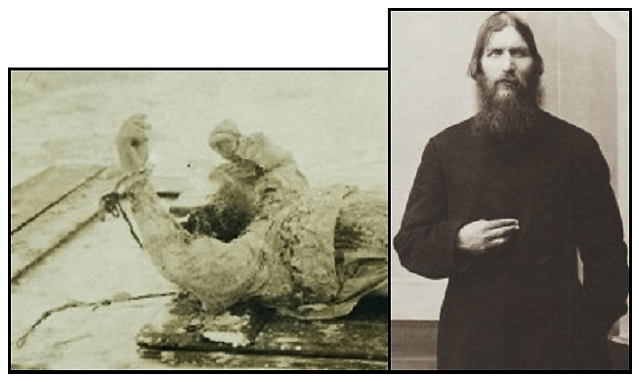 The second image shows how Rasputin placed held his fingers in benediction in life. TSARSKOE SELO. 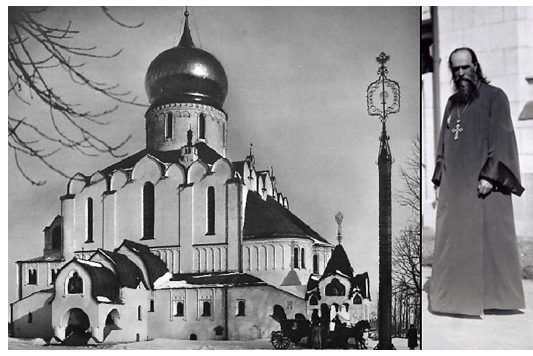 Grigorii Rasputins remains were brought to the Fyodorovskii Cathedral before burial that was officiated by the resident cleric, Father Alexander Vasiliev, 1916. Znameniye Bogomater icon that was found inside Rasputins coffin. The reverse was inscribed by Alexandra Fyodorovna, her four daughters. 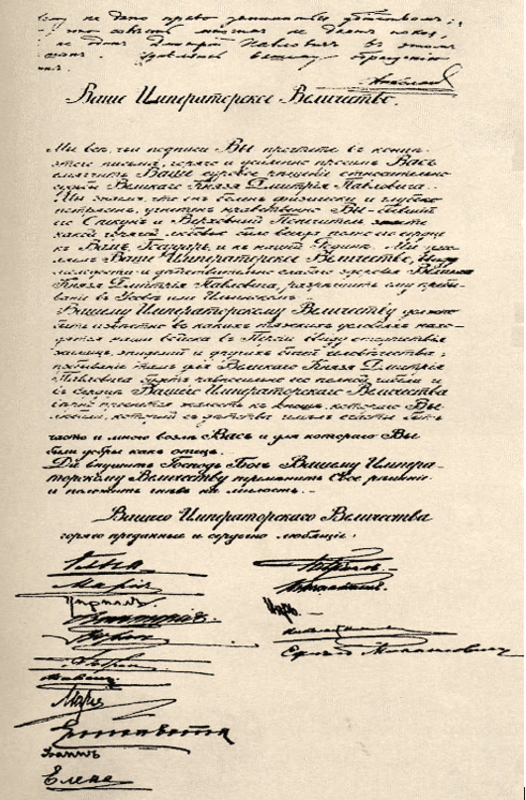 Anna (Taneeva) added her name and included the date of the Velikii Novgorod visit, 11 Dec. 1916. 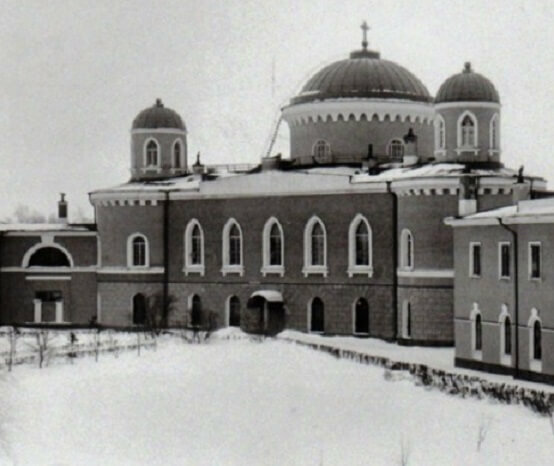 The partial construction of the Serafimovskii Sanctuary Chapel. The opened grave by the northern wall of the proposed chapel is to the right of the “X” and the pile of rocks that once overlay the grave are now scattered over the area. 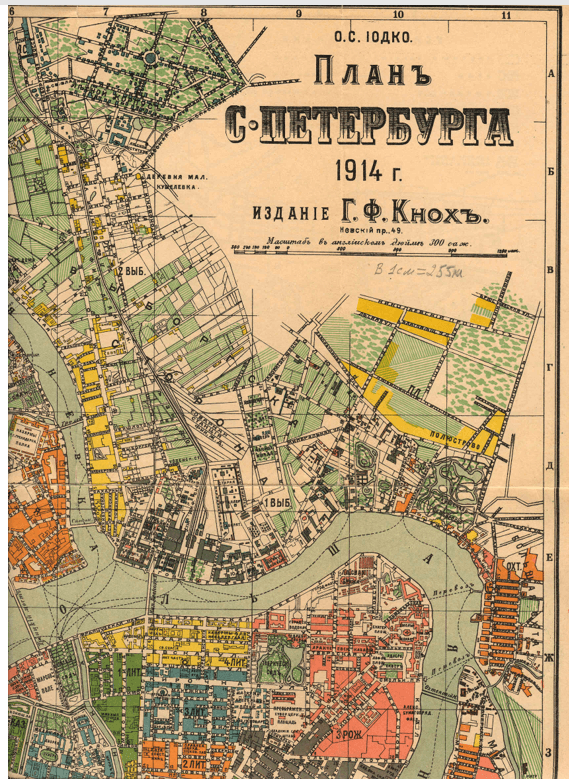 Published in Petrogradskaya Gazeta, March 1917. 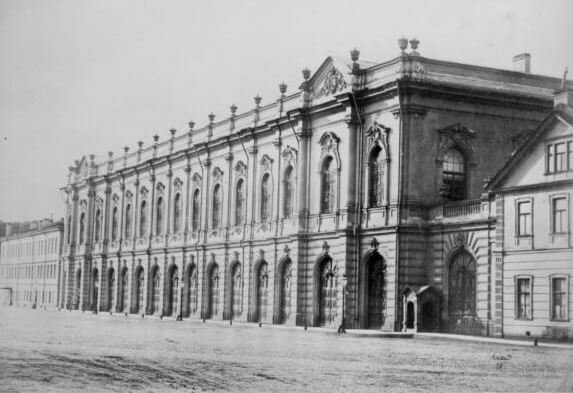 The rear view of the Imperial stables building (facing the Moika canal) shows the row of doors, one of which was used to conceal the coffin containing Rasputins remains, c. 1916. LESNOI. 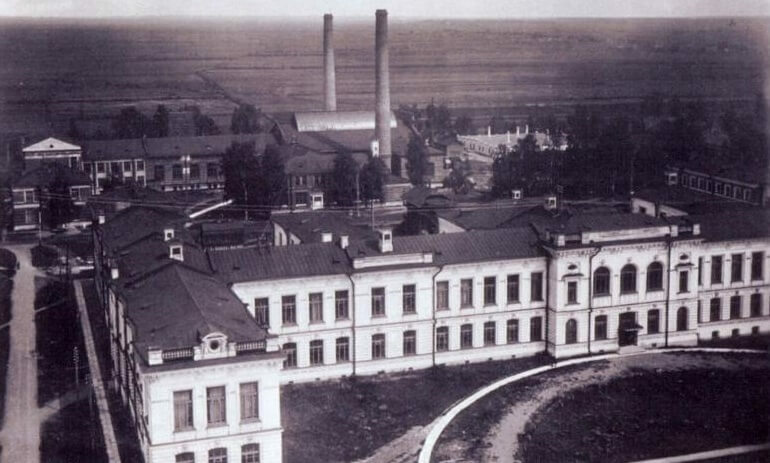 Aerial view of the Polytechnic Institute (of Emperor Peter the Great). The side road on the left led to the furnaces, where the two chimney stacks are visible, pre 1916. 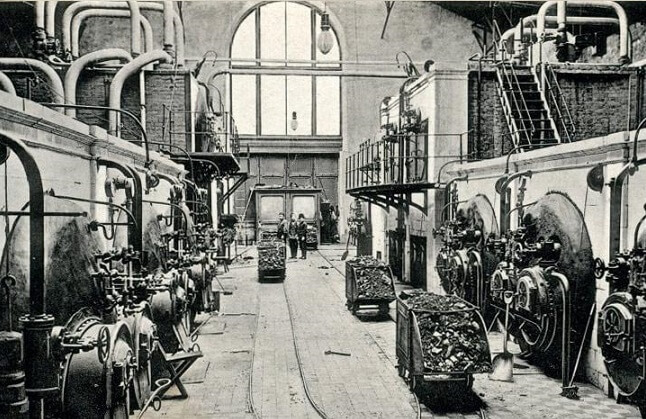 LESNOI.The cauldrons at the Polytechnic Institute, where Grigorii Rasputins remains were destroyed on 10/11 March 1917. 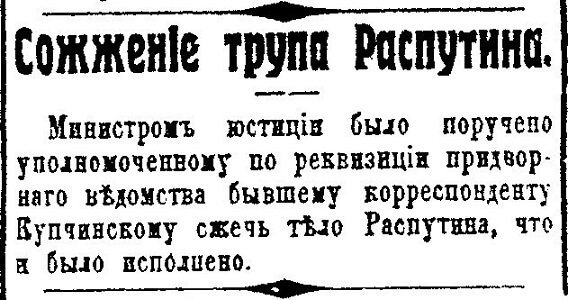 Newspaper notice dated 14 March reveals that Rasputin’s body was cremated. 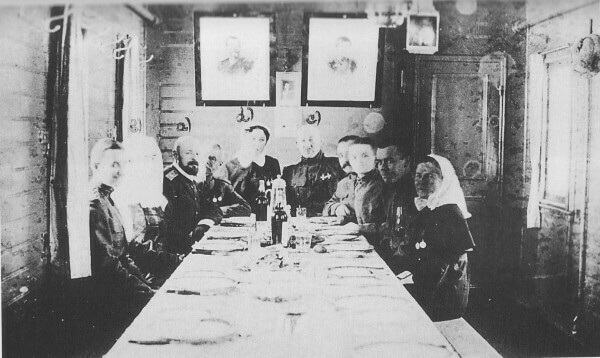 Vladimir Purishkevich, first on the left and Stanislav Lazovert (wearing two St. George Cross 4th Class medals) in one of Purishkevichs Red Cross trains, 1915. 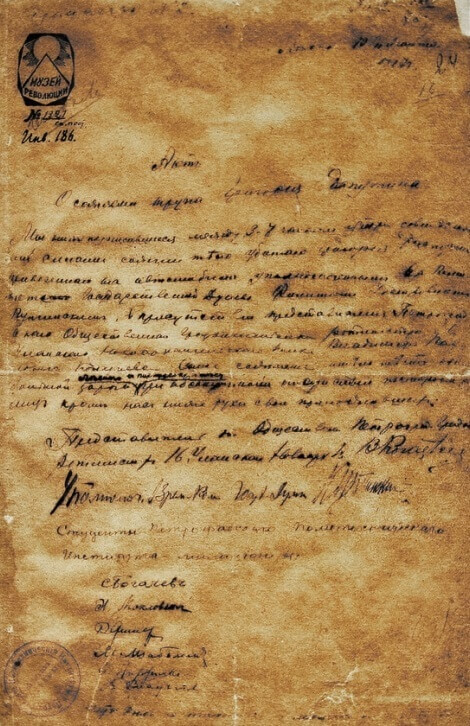 One copy of the Romanov Family petition forwarded to Nikolai II with the 16 signatures. The sovereigns response appears at the top of the page, 1916. No. 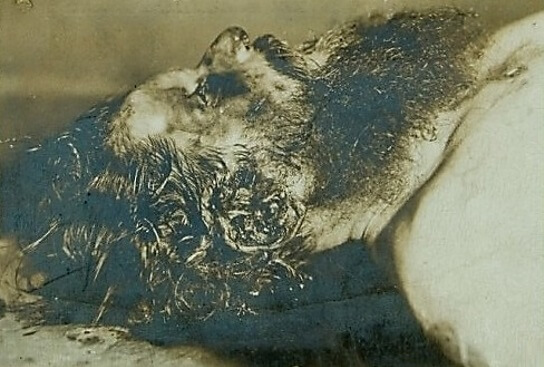 8: The Report that provides evidence that Rasputins corpse was cremated on the night of March 10/11, 1917 near Lesnoi, in the Petrograd region. 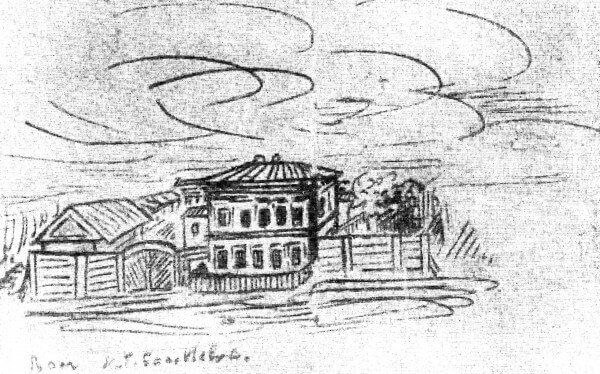 Grand Duchess Mariya Nikolayevnas drawing of Grigorii Rasputins house and yard, 1918.